Pneumonia remains the leading infectious cause of death among children under five, killing approximately 2,400 children a day. Pneumonia accounted for approximately 16 per cent of the 5.6 million under-five deaths, killing around 880,000 children in 2016. Most of its victims were less than 2 years old. Mortality due to childhood pneumonia is strongly linked to poverty-related factors such as undernutrition, lack of safe water and sanitation, indoor air pollution and inadequate access to health care. An integrative approach is urgently needed to tackle this important public health issue. Around half of childhood pneumonia deaths are associated with air pollution. The effects of indoor air pollution kill more children globally than outdoor air pollution. At the same time, around 2 billion children 0-17 years of age live in areas where outdoor air pollution exceeds international guideline limits. 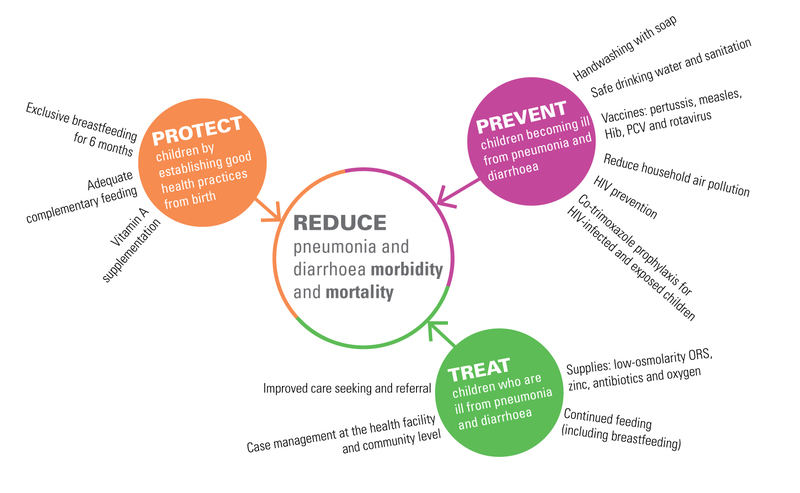 The Integrated Global Action Plan for the Prevention and Control of Pneumonia and Diarrhoea (GAPPD) sets forth an integrated framework of key interventions proven to effectively protect children’s health, prevent disease and appropriately treat children who do fall ill with diarrhoea and pneumonia. Exclusive breastfeeding for the first 6 months of life (without additional foods or liquids, including water) protects infants from disease and guarantees them a food source that is safe, clean, accessible and perfectly tailored to their needs. Nearly half of all diarrhoea episodes and one-third of all respiratory infections could be prevented with increased breastfeeding in low- and middle-income countries. Adequate complementary feeding and continued breastfeeding: good nutrition supports strong immune systems and provides protection from disease. From 6 months to 2 years of age, adequate complementary feeding – providing children with adequate quantities of safe, nutritious and age-appropriate foods alongside continued breastfeeding – can reduce child deaths, including those due to pneumonia and diarrhoea. Vitamin A supplementation: High-dose vitamin A supplementation helps maintain strong immune systems and can reduce all-cause mortality by 24 per cent and cases of diarrhea by 15 per cent. Children between the ages of 6-59 months should be protected with 2 high-dose supplements of vitamin A every year in countries with high under-five mortality or where vitamin A deficiency is a public health problem. Immunization: The Haemophilus influenzae type b (Hib) and pneumococcal conjugate vaccines (PCV) are effective in preventing the two most common bacterial causes of childhood pneumonia and the rotavirus vaccine provides protection against one of the most common causes of childhood diarrhoea-related death. The use of vaccines against measles and pertussis in national immunization programmes substantially reduces pneumonia illness and death in children. Safe drinking water, sanitation and hygiene: Almost 60 per cent of deaths due to diarrhoea worldwide are attributable to unsafe drinking water and poor hygiene and sanitation. Hand washing with soap alone can cut the risk of diarrhoea by at least 40 per cent and significantly lower the risk of respiratory infections. Clean home environments and good hygiene are important for preventing the spread of both pneumonia and diarrhoea. Safe drinking water and proper disposal of human waste, including child faeces, are vital to stopping the spread of diarrhoeal disease among children and adults. Reduced household air pollution: More than 40 per cent of the world’s population rely on solid fuels (wood, coal, animal dung and crop waste) to cook and heat their homes, exposing children to household air pollution and almost doubling their risk of pneumonia. Improved household air quality can reduce cases of severe pneumonia while also preventing burns, saving time and reducing fuel costs. The use of chimney stoves can cut household air pollution by half, reducing severe pneumonia by almost 30 per cent. HIV prevention: Preventing HIV and treating HIV infections with antiretroviral drugs helps maintain the immune system and reduce the risk of contracting pneumonia. Co-trimoxazole prophylaxis provides further pneumonia-related protection for HIV-infected and exposed children and can reduce AIDS deaths by 33 per cent. Saving children from pneumonia requires urgent action and recognizing danger signs – including fast and difficult breathing and a cough – is the first step. The treatment for most types of serious pneumonia is usually antibiotics, which typically cost less than 50 cents for a full treatment. However, not all children with symptoms of pneumonia should receive antibiotics: According to the WHO and UNICEF Integrated Management of Childhood Illness guidelines, only those cases classified by a health worker as pneumonia should be treated with antibiotics. Moreover, not all children classified as such have true pneumonia. That said, in settings without adequate diagnostic tools, the WHO/UNICEF guidelines provide a common standard by which health workers can assess and classify bacterial pneumonia illnesses requiring antibiotic treatment. Although it cannot be assumed that all children with symptoms have bacterial pneumonia and should receive antibiotics, the data indicate a big gap between the rich and the poor in treatment of symptoms of pneumonia: The poorest children in the poorest countries are least likely to receive treatment when ill. This gap is particularly wide in sub-Saharan Africa and South Asia. Taking children to a health care provider quickly can save their lives, yet, worldwide, only about two-thirds of children receive the necessary help and care when pneumonia symptoms arise. In sub-Saharan Africa, where most pneumonia deaths occur, less than 50 per cent of children with pneumonia symptoms are taken for care. As data from population-based survey data indicate, there has not been major progress in careseeking behavior for pneumonia symptoms since 2000. UNICEF, One is too many: Ending child deaths from pneumonia and diarrhea, UNICEF, New York, 2016. Ending Preventable Child Deaths from Pneumonia and Diarrhoea by 2025: The integrated Global Action Plan for Pneumonia and Diarrhoea (GAPPD), WHO, Geneva, 2013. UNICEF, Pneumonia and Diarrhoea: Tackling the deadliest diseases for the world’s poorest children, UNICEF, New York, 2012.
WHO and UNICEF, Global Action Plan for the Prevention and Control of Pneumonia (GAPP): Report of an informal consultation, WHO, Geneva, 2008.
WHO and UNICEF, Integrated Management of Childhood Illness, WHO, Geneva, 2008. UNICEF and WHO, Pneumonia: The forgotten killer of children, UNICEF, New York, 2006. Liu, Li , et al. (2015), ‘Global, regional, and national causes of child mortality in 2000–13, with projections to inform post-2015 priorities: an updated systematic analysis’, Lancet, 385, 430-40. Campbell, H., et al., ‘Measuring Coverage in MNCH: Challenges in monitoring the proportion of young children with pneumonia who receive antibiotic treatment’, in PLOS Medicine: published 7 May 2013, info:doi/10.1371/journal.pmed.1001421 (see: PLOS Collection: Measuring Coverage in Maternal, Newborn, and Child Health). Acute respiratory infection (ARI): This includes any infection of the upper or lower respiratory system, as defined by the International Classification of Diseases. Acute lower respiratory infections (ALRI) affect the airways below the epiglottis and include severe infections, such as pneumonia. Pneumonia: Pneumonia is a severe form of acute lower respiratory infection that specifically affects the lungs and accounts for a significant proportion of the ALRI disease burden. The lungs are composed of thousands of tubes (bronchi) that subdivide into smaller airways (bronchioles), which end in small sacs (alveoli). The alveoli contain capillaries where oxygen is added to the blood and carbon dioxide is removed. With pneumonia, pus and fluid fill the alveoli in one or both lungs, and this interferes with oxygen absorption, making breathing difficult. Symptoms of pneumonia: Signs of pneumonia are a combination of respiratory symptoms, including ‘cough and fast or difficult breathing due to a chest-related problem’. Children exhibiting such symptoms should be taken to a health provider for a clinical assessment for pneumonia. Not all children with symptoms of pneumonia should receive antibiotic treatment; only children with a confirmed case of pneumonia (classified as such by the Integrated Management of Child Illness guidelines and based on a rapid respiratory rate counted by a health worker) should receive them. Current pneumonia-related interventions at the population level are measured through household surveys. However, evidence indicates that it is not possible to measure pneumonia prevalence among children under age 5 during a household survey interview or to ascertain underlying pneumonia for children with these respiratory symptoms. Measurement limitations: Data collected through national household surveys, such as Multiple Indicator Cluster Surveys (MICS) and Demographic and Health Surveys (DHS), report on the prevalence of symptoms of pneumonia, based on information about whether children have experienced coughing and fast or difficult breathing (due to a problem in the chest) in the two weeks prior to the survey. These children have not necessarily been medically diagnosed, and thus these data should be interpreted with caution. This limitation affects the accurate measurement of the coverage indicator on treatment of symptoms of pneumonia with antibiotics. The indicator becomes underestimated due to inflation of the denominators with children with apparent symptoms of pneumonia, but who did not actually have pneumonia, and therefore were not treated with antibiotics.